Branded visual content has become a major marketing tool for many major businesses. Hulu, Netflix, GE and others are constantly coming up with unique and entertaining ways to create visual content that reflects their brand message. This is a trend that all businesses should be taking advantage of, especially considering that branded images can garner 67% more of an audience’s attention. And no matter if your marketing focus is inbound or outbound, branded visual content can capture viral attention or be used as a strong remarketing tool. This post will show you 9 inspiring examples of branded visual content, and show you some helpful tools you can use to create similar ones for your business. Sharing inspiring and entertaining photographs on social media can be a great marketing tool that reflects a brand’s purpose. They regularly share cool action shots that demonstrate the photographic possibilities of using a GoPro, likely inspiring many to buy. Any business with a camera (or even a phone) can reap the same benefits of using photographs to drive a brand image. All you have to do is find a creative way to incorporate your product’s benefits, or a positive message about your brand, into the shots you’re taking. The shots you share on social media can even serve the simple purpose of putting a face to a brand. Photos of your team at work can demonstrate a positive brand image, and expand your reach. On Instagram, photos with faces get 38% more likes than those without. Emojis are used all over the internet. In fact, 92% of the online population use them at least occasionally. So why not take advantage of this visual element for marketing? Brands already are. Domino’s customers can now place orders by simply tweeting or messaging a pizza emoji. The initiative has increased the restaurant’s online ordering to 60%, and generated about 1.2 billion earned media impressions. But you don’t even have to get that complex to incorporate emojis into your marketing media. 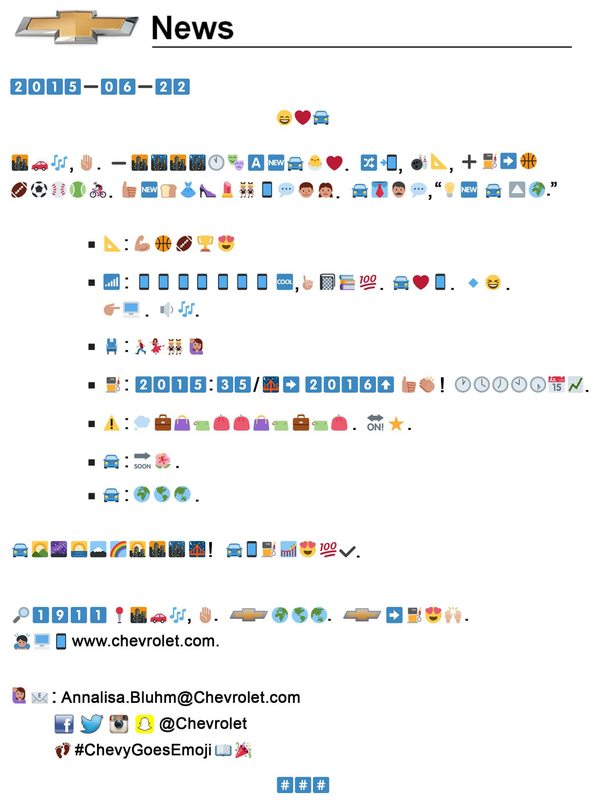 Simply using relevant emojis in your branded social media posts can help you improve interaction with your audience. And they give powerful impressions, similar to actual photos. Research has shown that emoticons can improve enjoyment and personal interaction of messages. Memes are one of the most powerful languages of the internet. They go in and out of style pretty fast, but brands who have their finger in the internet pulse can quickly put together some ultra-relevant branded content. You might think data visualizations are only relevant for big data companies or scientific organizations, but think again. All sorts of businesses, even Netflix, are using data visualization to draw interest and reflect their brand image. 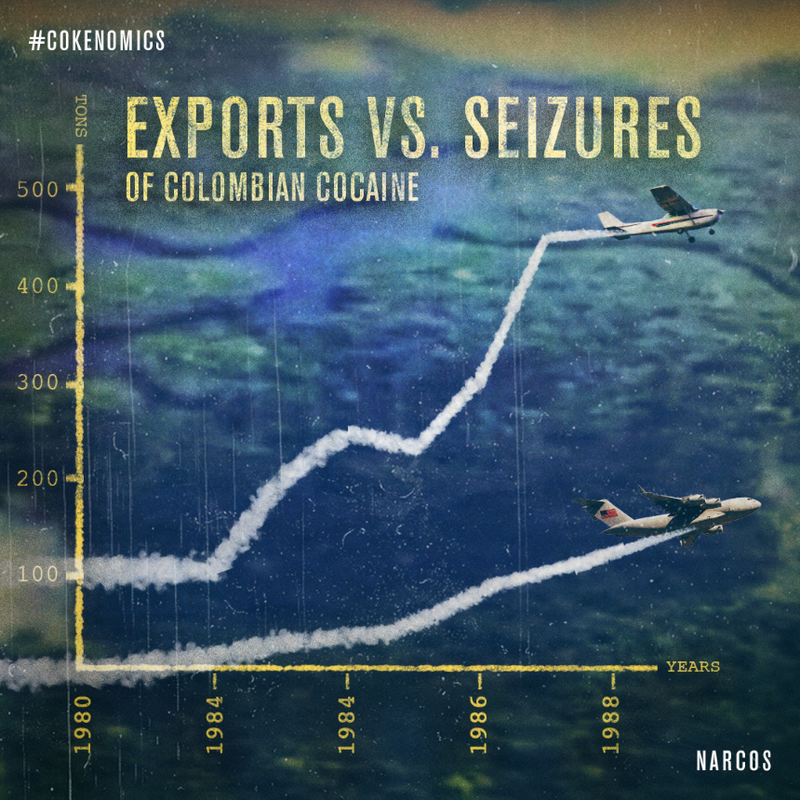 It’s visually appealing, informative, and gets people thinking about the state of cocaine trade in the 1980’s. So what if you don’t have any data to work with? In reality you probably do. Information about customer demographics can be used to create interesting custom data visualizations, for example. You can also research relevant data related to your industry to create your graphic, or even poll your audience to get some input. You can use data visualizations to entertain and inform, as well as enhance your existing content. Research has shown that colored visuals that accompany text can increase a viewer’s willingness to read by 80%. GIFs have always been a fun piece of visual content on the internet, but they’ve really taken off this year as social media platforms made it easier to find and share them. 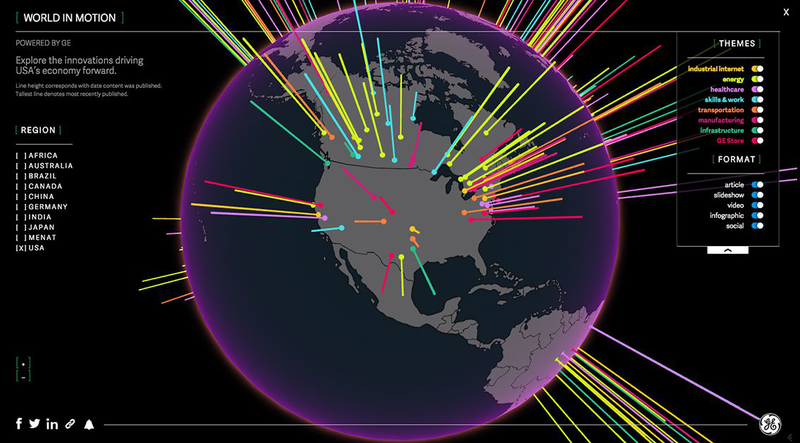 GE takes branded content and data visualization to a whole new level by developing their own interactive graphics. A great example is World in Motion, a graphic that allows you to find and read news stories about regions around the world. This unique way to explore content lets you geo target a specific region. It also draws attention to major industries that GE is involved with around the world. And yes, you can create your own interactive graphics as well, without learning to code. Visme can help you create a variety of interactive content types. Or check out Mapbox and Batchgeo if you want to create interactive maps. Nearly 52% of marketing professionals around the world say videos have a better return on investment than any other content type, making it the most popular type of branded visual content out there. Just look at the Super Bowl ads. 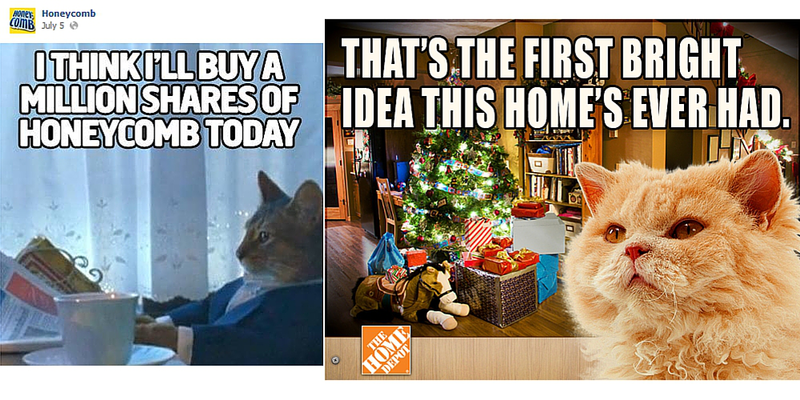 Instead of focusing on direct pitching, all of the ads are aimed to capture your attention and entertain. That’s what branded content is all about. There are a lot of great examples out there, but Marriott has made a strong showing with their branded videos. Thier first short film released on YouTube, French Kiss, is the perfect blend of entertainment and digital marketing. 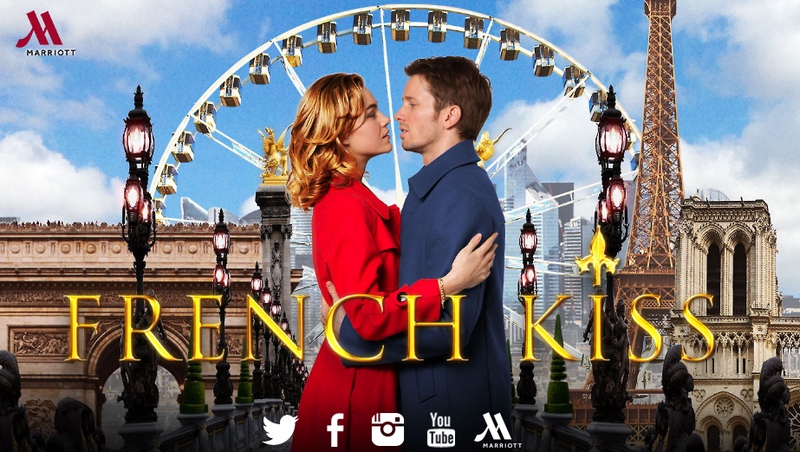 The film follows two strangers on a romantic adventure through Paris, with the Marriott hotel as a subtle backdrop. The film has gained a lot of praise, and promoted the hotel chain to create a followup film, Two Bellmen. You can also opt to create your own animated videos using tools like PowToon or Moovly. Quote cards are another simple piece of branded visual content, but they can leave a strong impression and encourage lots of shares if you do them right. You know which brand is surprisingly good at these? The brand does an excellent job by finding funny lines and relatable quotes that would resonate with their target audience. And if it gets laughs, it will likely get shares. You can create your own quote cards with an image editing tool like Canva, or try QuotesCover, which is designed specifically for creating quote cards. Live streaming is another great way to take advantage of the power of video content. Syndacast predicts that 74% of all internet traffic will be video by 2017. Live streaming can also help you draw audience’s attention by showcasing events and product demonstrations, or offering live customer service. 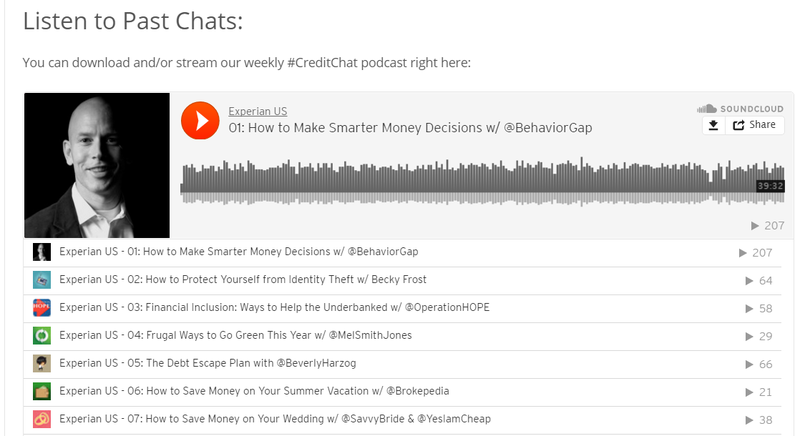 Experian makes great use of live streaming on Twitter, YouTube and Periscope by broadcasting a weekly live chat (#CreditChat) about helpful finance related topics, such as improving your credit score. If you want to start live streaming for your business, all you need is Periscope, an app to create live streaming video with Twitter integration. 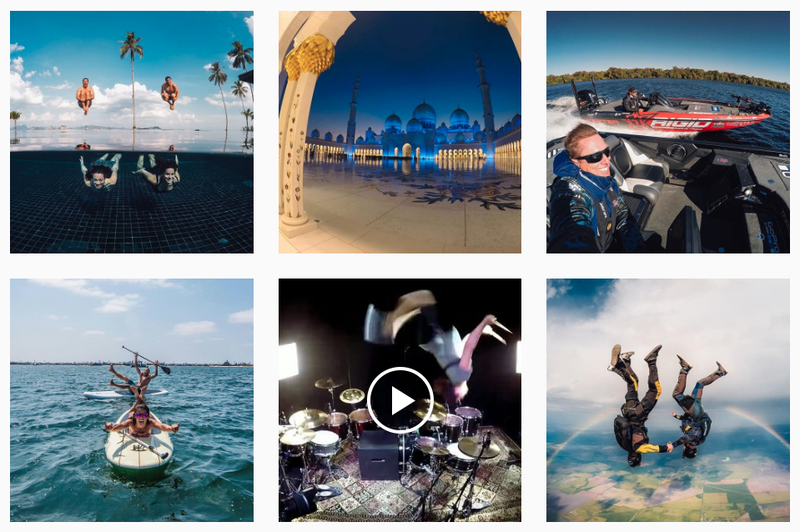 These 9 examples are just a few of the many ways big companies are taking advantage of branded visual content to connect with their audience. In fact, 65% of senior marketing executives consider visual assets such as photos, videos, illustrations and infographics, core elements for communicating their brand story. And thanks to a quickly changing digital landscape, innovative tools make this marketing tactic more accessible for all kinds of businesses. 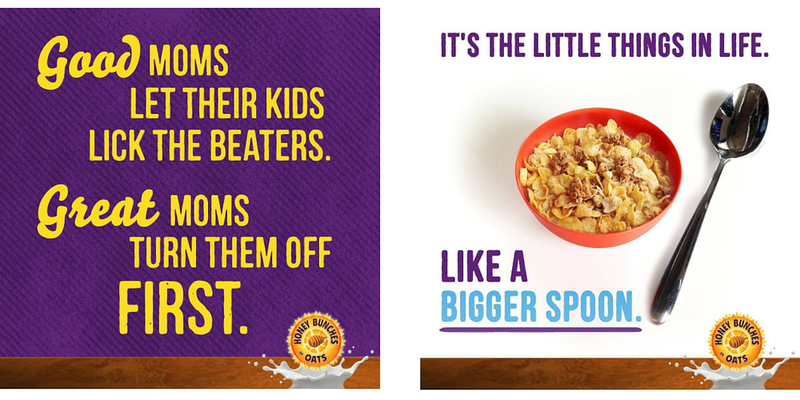 Start taking advantage of branded visual content to entertain and expand your reach today.